Developed by Free Lunch Studios founders Matt Ryan and Steve Kanaras, Comic Construction is an educational program focusing on all the skills required to create comics and graphic novels in their myriad of forms! Matt travels to schools, libraries and groups performing a stage show with the construction theme, as well as directed workshops where students of all ages learn the tools necessary to construct their own comics. The Comic Construction program has been in use for over four years, but Matt has many more years of experience teaching the craft of comics. 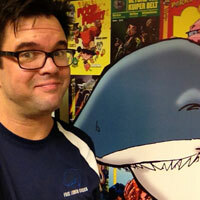 Matt has been a professional artist, comic author, creator and teacher for over twenty years. With a wealth of specialized knowledge, he can bring your students or group members a unique experience, with concepts rarely encountered in classrooms.